Turn on cellular data or use Wi-Fi to access data. while I'm not connected to Wi-Fi and I'm trying to use any apps that need a data connection. Cellular data is turned on, and I'm not in airplane mode or anything. LTE was working just fine yesterday. I have tried Settings > General > Reset > Reset Network Settings with no success. Is this likely a problem with my phone, or with PagePlus? How can I resolve it? Thanks! I have finally got this working. As noted above, my problem initially was the opposite of the OP. I wanted to remove the cellular data (APN profile) when I travel, then restore it when I go back to the US. There are two parts to the solution, each covered elsewhere in more detail. Here is how I put them together. 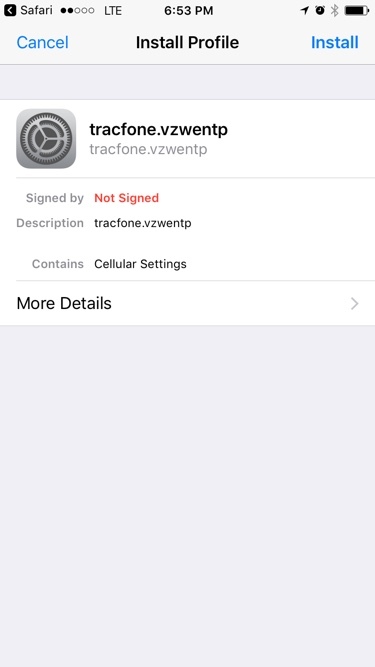 If Tracfone/Verizon has pushed a profile onto your phone with iOS 11, it will be hidden and cannot be removed. You have to backup and then edit your backup with iBackupBot. (This is described elsewhere.) The simplest edit (and the only one that worked for me) is simply to remove the profile file. "mobile/com.apple.managedCarrier.plist" Then still using iBackupBot, you do a full restore including reboot. The result is a restore with all your data, etc. intact, but no profile installed. After I did this, my foreign SIM worked fine with cellular data. Although I am not back in the US, I did go to the iphone.flexserve.net site where, as Aaron suggested above, I installed "Straight Talk (tracfone.vzwe...)" as my profile. Of course, my French cellular data immediately stopped working. However, in Settings, General, I now see the Profile and this one can be removed. I did that and Bingo, French cellular data is restored. Unfortunately, this is a solution for techies. The good news is that you only need to do the backup, delete profile from backup, and restore once. After that, you have an easy way to delete the profile and then reinstall it. I think it will be important to install the profile immediately on returning to the US, before Tracfone/Verizon pushes out another hidden profile. Then refuse all proposed carrier settings updates. Also, who knows if this will keep working when there is another iOS update. For what it's worth, below is the email I got back from PagePlus technical support. Installing the configuration profile worked for me, but CAUTION, iOS says that the linked configuration profile is unsigned which means that we can't be confident that this is the exact file PagePlus intended us to download. Theoretically, a malicious hacker could swap it out with their own file, and do bad things to our phone once we install it. So proceed at your own risk! This is a response to the Ticket#[redacted]. We do apologize for any inconvenience you have experienced. Checking the account [redacted], we have verified that your phone is provisioned correctly in our billing system. You are still good with the $55 plan until tonight at midnight. You already have a reserved balance that will automatically renew the account after the current $55 plan expires. You will need to update your data connection again by following the steps below.
? To resolved data connection, please follow this basic troubleshooting steps that I am providing you. 1) Place your phone on airplane mode for about 10 to 15 seconds. 2) Disable the airplane mode and restart your phone. 3) Once your phone is on, wait until it will displays atleast 3 or more signal bars. 4) Make sure that your WiFi connectivity is off and Mobile data is on. 5) Try to access some of your phone online applications to check if its working.
? If not, we need to install a PROFILE in your phone to have your data service activated.
? To install a PROFILE you must disable your Mobile data. 1) Then kindly enable your WiFi, and make sure that you are properly connected. 2) Open your SAFARI browser then, open this link ivzwentp.tracfone.com (must be in lowercase), 3) Click install PROFILE then select INSTALL. Please take note: Some iPhone cannot recognize the link provided. But don't worry it is safe, so please continue to install. 4) Once it was installed successfully. Please disable your WiFi connectivity and enable your mobile data. 5) Make sure that LTE is showing at the top of your phone screen. Try to access some of your phone online application to check if everything is working good. NOTE: Before doing those steps, make sure that you have atleast 50% of battery and good signal bars. If this troubleshooting steps will not work on your phone, please contact Customer Service at 1-800-550-2436 for further assistance. Please contact us if you have any further questions or concerns. You can reach us by dialing #737 (#REP) or #22273 (#CCARE) from your cellular phone. You can call 1-800-550-2436 from any other phone. You are also able to engage in Live Chat on our website at www.pagepluscellular.com. All methods are available Monday through Sunday from 8 AM ? 11:45 PM (all times Eastern Standard). "Please turn on your WIFI, open Safari and enter ivzwentp.tracfone.com, Accept the changes to install the new profile." I installed the profile even though it is unsigned, since the link is provided by customer service people directly. After weeks of my tracfone not working, I finally found an answer with tracfone customer service. Go to iphone.flexserve.net. Select APN & Proxy Changer, Enter your country, then for operator, select "Straight Talk (tracfone.vzwe...)", then click "Generate Profile" and install the profile. Turn your phone off and then back on. If that doesn't work, try Verizon (4G LTE) as the operator. I have had this same issue on my iPhone SE. I use tracfone and I bought a 200 minutes card yesterday. It added the minutes and data and texts into my account but then my phone could not use data. I had plenty of bars of signal and it showed Verizon LTE (I have the cdma tracfone card). I had to call tracfone several times before someone there could help me but it is resolved now. They had to update something and the rep asked me the MEID number and IMEI number from my phone plus my sim number. It took about 30 minutes once I reached a person who knew how to fix this. Also this has happened to me a couple times before. I love having affordable service on an iPhone so I will continue to deal with this inconvenience. Also I do NOT believe this is an issue with the gsm sims but the CDMA has much better signal strength where I live. I had same issues but then found this out took me a week but now my data works go to https://iphone.flexserve.net and select Verizon 4g not tacfone profile and you should be able to use your data. This is what worked for me, which is a bit different than what's already posted: I did a full DFU mode restore to the latest firmware, set up the phone, factory resetted it (settings > general > reset > 2nd option from the top), set up the phone again, did a Cellular Data toggle first off then on (settings > cellular > cellular data OFF/ON), and finally the web started working. There was no need for any additional profile download, and it worked perfectly with both Verizon and PagePlus sim cards... your mileage may vary. I had the same problem in December and that is what Tracfone told me to do as well. It works. I will say I seem to have this issue every time I add data to my phone. Ok. Here is how I fixed my no data problem with Tracfone and iphone 5se. Put the Tracfone sim in an iphone that the data works in. (Iphone 6 and above). Be sure the data is working in that newer phone. Backup the newer phone on itunes. Re-set the phone and all settings on the iphone 5se. Restore the iphone 5se with the back-up from the newer iphone. Once the iphone 5se has been re-started, go into celluar settings and turn Cellular Data "Off" and then turn back "On". Turn wifi off. check to see if cellular data is working. It should be. Not the answer you're looking for? Browse other questions tagged iphone network cellular-data ios cell-phone-carriers . Why do I occasionally get the message “could not activate cellular data network” when opening the sms app?